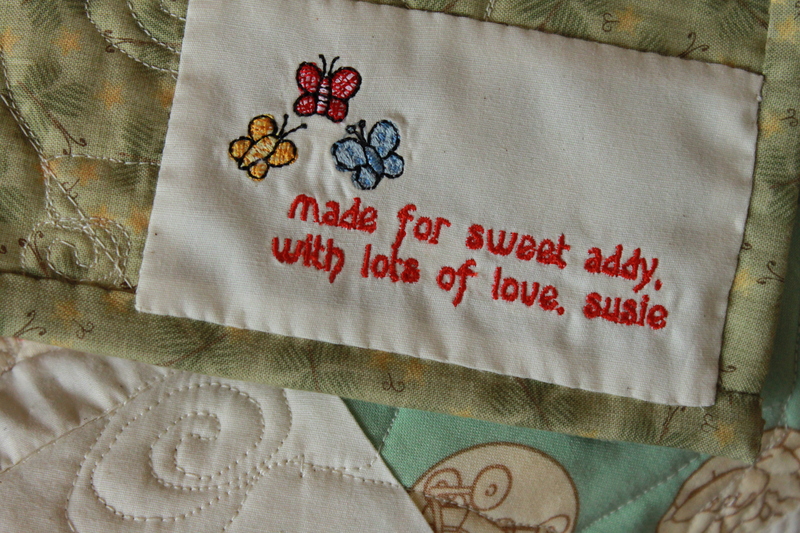 Sweet Addy’s Birthday was this last week and I have been working on a quilt for her. I found the pattern on Pinterest. I just love looking at all the ideas there, because most often it leads me to some awesome websites and blogs. The Pin for this quilt lead me to the Moda Bake Shop blog. 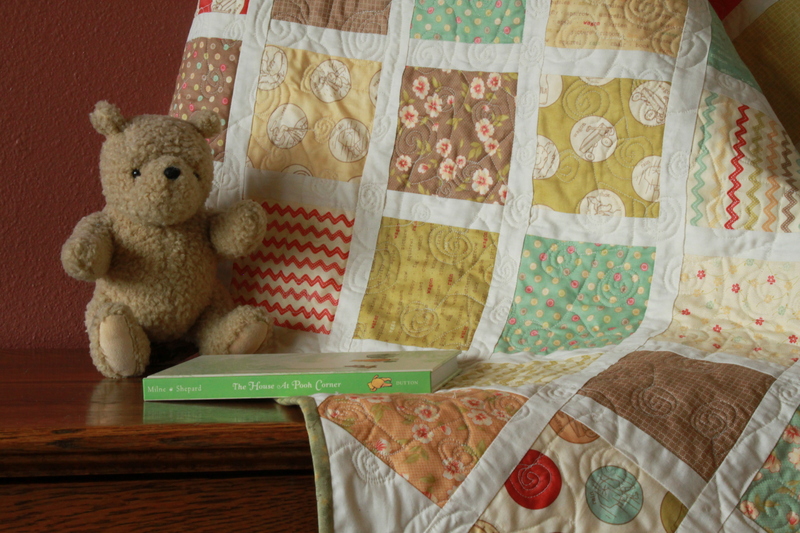 This pattern is ‘Baby Lattice Quilt’ by Amy Smart. There are all sort of fun projects there and I have put a link on my side bar so you can easily check it out. Anyway, back to the quilt. About a year and half ago on a trip to Sandpoint Idaho, I found a quilt store in Coeur D Alene and just had to stop and check it out. I bought a couple of charm packs and 2 yards of material that matched thinking I should be able to make a baby quilt for someone with this. So it has been sitting in my stash, waiting for the perfect little one. I found it a month ago and decided this was meant for Addy! I made some modifications, as usual; I made it a little bigger and then added some charm blocks to the back. 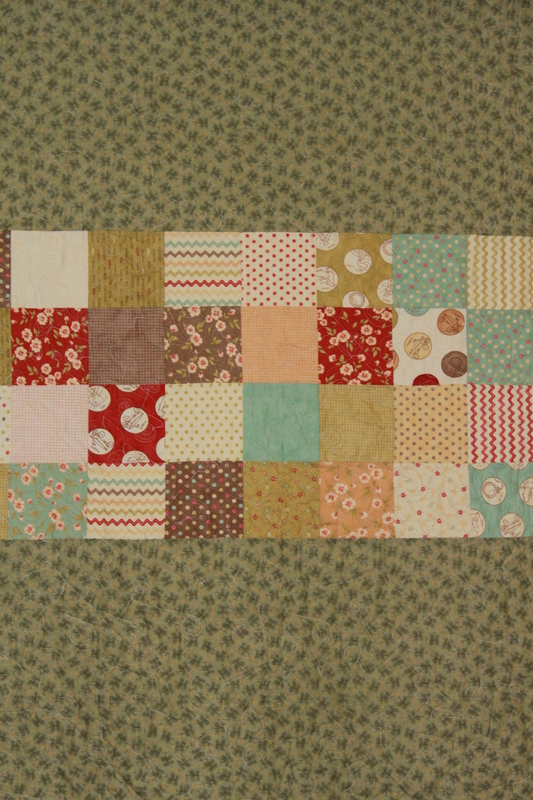 The top came together in an afternoon and I quilted it last week on the machine. I decided to try something a little different than my standard stippling and came across another blog via Pinterest, ‘The Free Motion Quilting Project’. I decided to give the ‘Lollipop Chain’ a try. They really didn’t look like lollipops, but more like lopsided spirals! 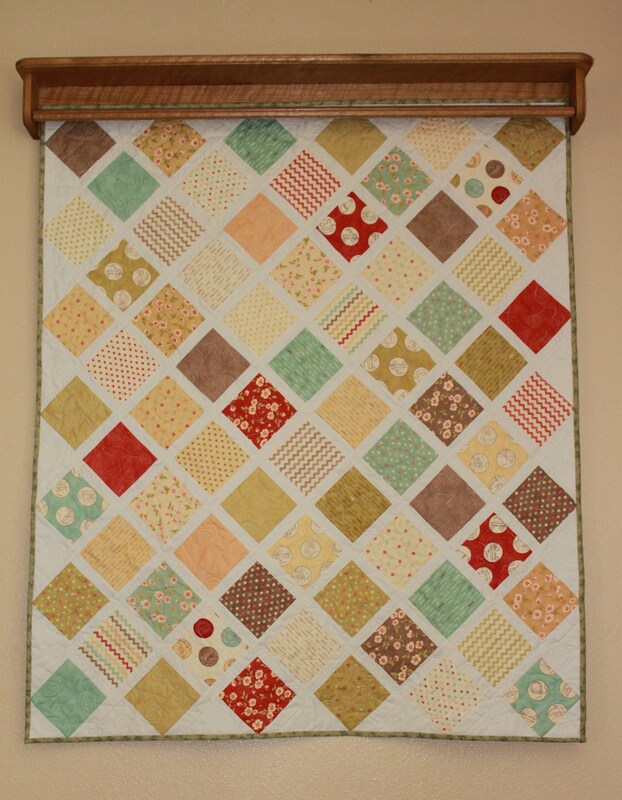 It was fun and I am getting more and more comfortable with machine quilting. I’m finding out that I really need to label my quilts. I should have put the date on this but didn’t think about it at the time. This one should be easy to remember though, Addy’s first Birthday! On Point 5 inch Charms with 1 inch sashing. Fun backside with Charm squares. Nice job Susie. It is beautiful!! Thanks Tracy, sorry I didn’t get back with this reply, I still new at this! This is quilt is beautiful! Whimsy is one of my favorite fabric lines. Thank you, it was fun making it!